A dramatic transformation for model, Amy, at Anh Co Tran’s Curated Cutting class hosted by Witch Hazel Salon in Indianapolis this past year! Amy’s previous one-length shoulder length style felt heavy and weighed down, despite her fine hair, giving an appearance of flatness and thinned out hair. 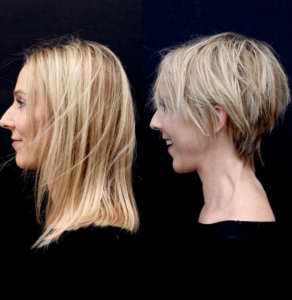 To remedy this, Anh gave her a mixed layered pixie cut with a graduated back to lift the hair and sculpt the back of the head, throwing in longer layers throughout for a modern and versatile style. The cut was finished off with L’Oreal’s Next Day Hair for texture and DePolish to define longer layers, giving the cut movement.